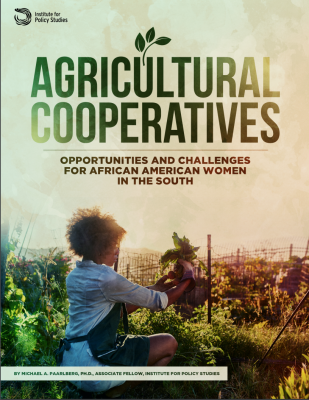 This report found that agricultural cooperatives are a promising area of economic opportunity for African American women in the rural South, who face some of the sharpest disparities in economic advancement. By increasing the local availability of quality food, these businesses also have the potential to improve health indicators in a region marked by disproportionately high rates of obesity, diabetes, and other related problems. Yet prevailing economic development models in these states are heavily skewed toward subsidizing large companies that offer few benefits for rural African American women. Support for agricultural cooperatives mostly comes through the federal government, however such funding is dwarfed by state government subsidies for large corporations. Alabama, Mississippi, and Georgia have each offered massive tax breaks and other subsidies to attract large manufacturing facilities. Comparatively, the U.S. Department of Agriculture’s Rural Business Enterprise Grant Program has awarded a total of just $2.3 million disbursed among all agricultural business development grantees in these three states since 2010, and another USDA grant program for specialty crop development amounted to less than $2 million in 2017 for all awarded applicants in these three states. The service sector employs the majority of workers in the Black Belt counties of Alabama, Mississippi, and Georgia, which are largely untouched by the companies subsidized under current state economic development models. The average weekly wages in these counties are all lower than state averages, unemployment is higher, and the share of employment in manufacturing is under 15 percent in all three states. Despite high barriers, African American farm co-ops are harnessing existing knowledge and entrepreneurialism that trace back generations and should be at the center of an alternative economic vision for the South. Farmers report that their top challenge is financing. With modest increases in public investment in technical support and start-up capital, such cooperatives could greatly expand into new markets, employ significant numbers of people, and contribute healthier food to their communities.